This is College Physics Answers with Shaun Dychko. We’re told that the capacitance in our RC Circuit is 0.5 micro Farads which is 0.5 times ten to the minus six Farads. The time constant is a product is the resistance multiplied by the capacitance. And we can solve for R by dividing both sides by C. And we get the minimum resistance when you have the time constant at its minimum. Two seconds divided by the capacitance 0.5 times ten to the minus six Farads which is 4.00 Mega Ohms. 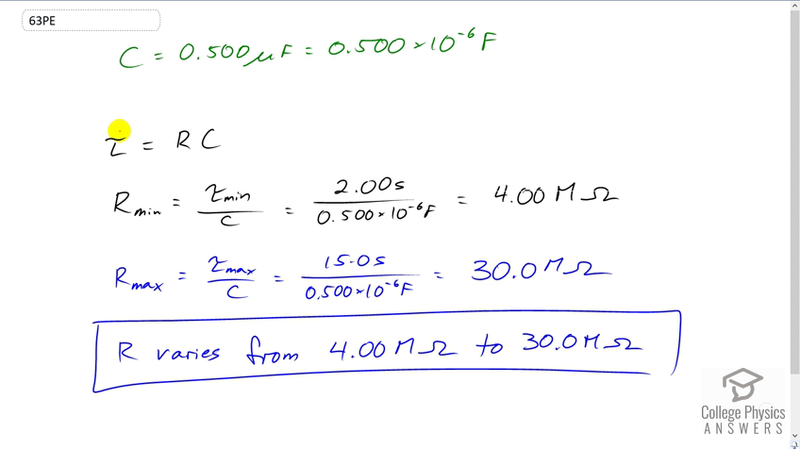 When the resistance is at its maximum, that’s when you have the maximum time constant divided by capacitance. So we substitute 15 seconds for tau and we get 30.0 Mega Ohms. And so the resistance must be able to vary from four Mega Ohms to 30 Mega Ohms to change the frequency of the oscillation of the wiper blades.